ClassicFlame Roll Away Mantel Packages offer the warmth and ambiance of a traditional fireplace combined with enhanced safety and ease of use. 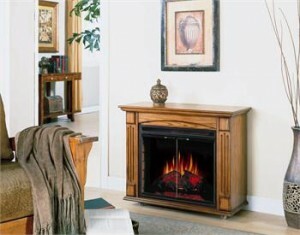 ClassicFlame boasts the reputation of designing and assembling the finest furniture in the Electric Fireplace industry. Not only is this roll away a beautiful, functioning fireplace – it is also a well-crafted piece of furniture.